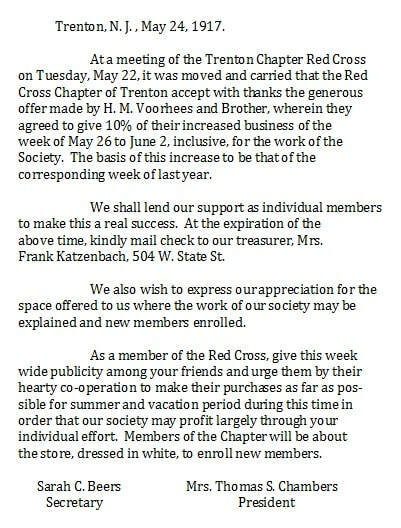 "That which we call a Red Cross Chapter is a highly perfected piece of social machinery. Its motor-power is supplied by the highest and yet the commonest human impulses and its product, applied humanity, is the brightest hope of a war-wrung world…"
While certainly allowing the opportunity to contribute to the war effort, membership in the Red Cross afforded women many opportunities for social interaction. Trenton Evening Times, May 11, 1917. Trenton Evening Times, June 12, 1918. 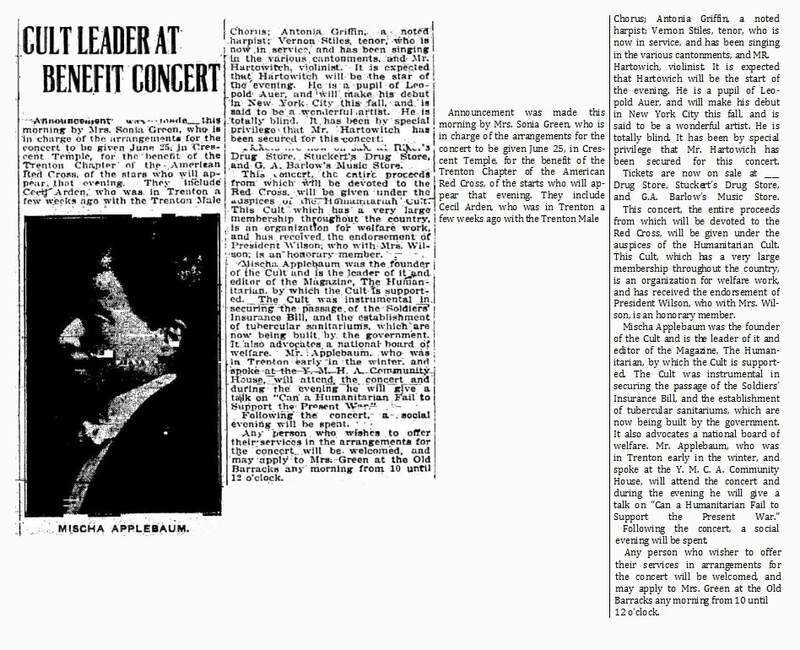 Trenton Evening Times, July 26, 1918. 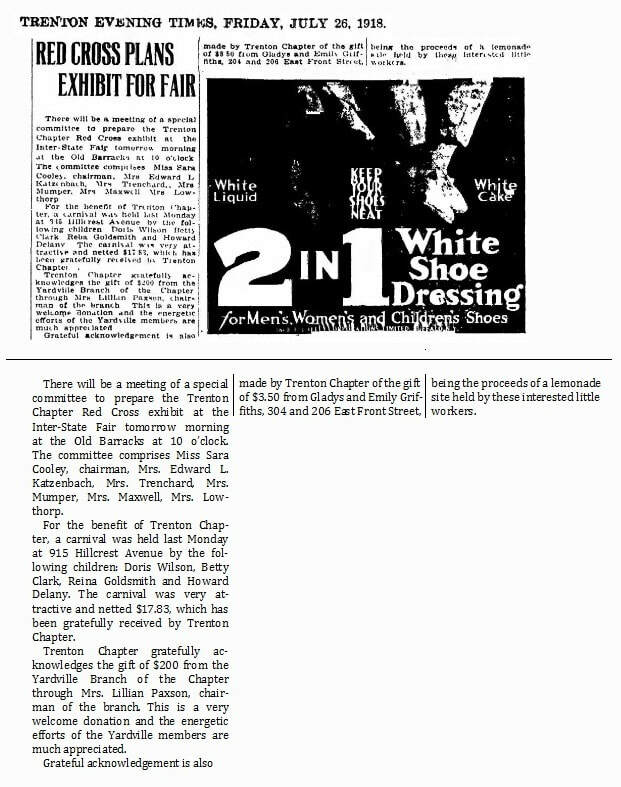 The Red Cross welcomed any and all volunteers. 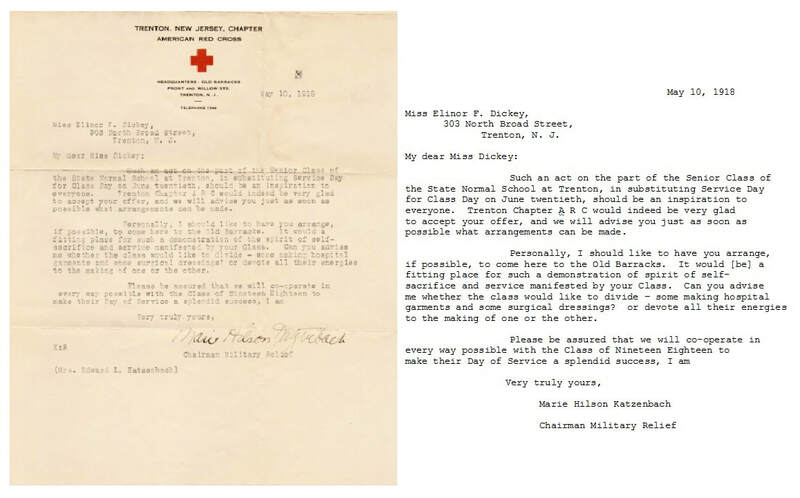 The letter below, a reply from Marie Hilson Katzenbach, Chairman of the Military Relief Committee and member of the Old Barracks Association, commended the “spirit of self-sacrifice and service” evident in Ms. Elinor Dickey and members of the senior class of the State Normal School (now The College of New Jersey). 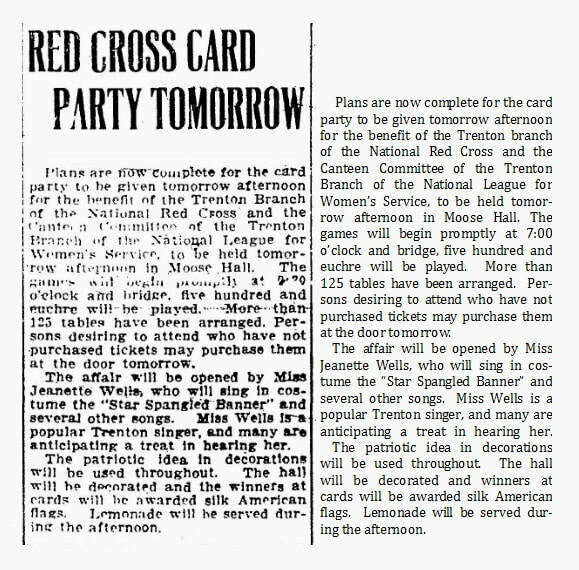 Undoubtedly, Elinor and her classmates recognized the importance of volunteering with the Red Cross and the opportunity to contribute to the war effort. Archives of Old Barracks Association. Trenton Evening Times, June 22, 1918. After completing their day of service, the Trenton Evening Times published a piece detailing the Senior Class' sewing accomplishments of the day. These men were oftentimes involved with patriotic and civic organizations of their own. William S. Stryker was the President of the Society of the Cincinnati of New Jersey, and was also a member of the Society of Colonial Wars in New Jersey. Thomas Stryker Chambers, husband of early Old Barracks Association president Jennie Scudder Chambers, was a member of both the Society of Colonial Wars and the New Jersey Society of the Sons of the Revolution. Vice-Chancellor Edwin Robert Walker was a member of the Sons of the Revolution and the President of the Trenton Historical Society for a time. The wives and families of such men were usually quite affluent, and were often able to devote their time to charitable causes. 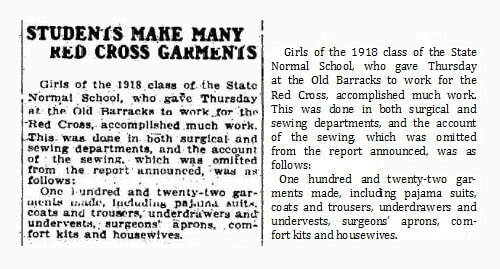 Many women maintained memberships in the Old Barracks Association, one or more patriotic societies, AND the Red Cross. Devoted to service, such women wholeheartedly focused on their Red Cross endeavors. Trenton Evening Times, May 24, 1917. 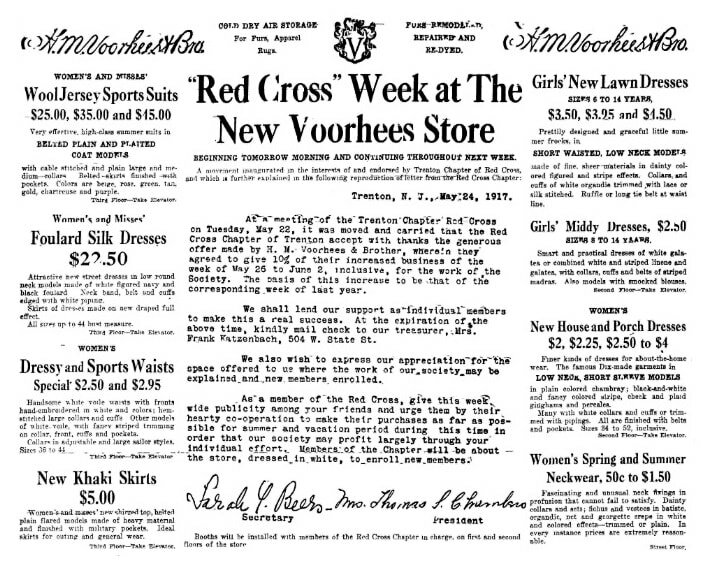 This advertisement encourages shoppers to to support Red Cross Week at the H.M. Voorhees and Brother Store in Downtown Trenton. Voorhees is the husband of Old Barracks Association Secretary Cora March Voorhees.